(September 19, 2018, York, Pa.) — With three weeks to go until the York Career Fair, more than 40 companies have already signed up to meet with potential employees at the annual event hosted by SportsRadio 1350 WOYK and the York County Economic Alliance (YCEA). 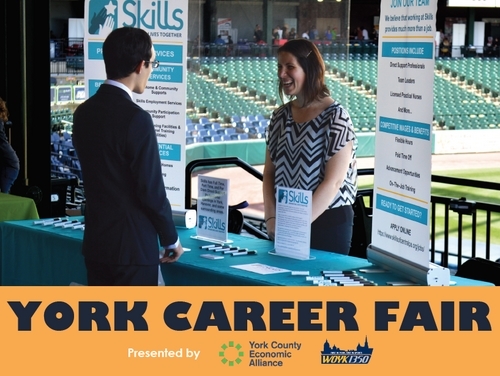 To help those employees prepare for the October 11 event at PeoplesBank Park, the York Career Fair Committee announced three free prep sessions in the coming weeks. Tuesday, October 9, 9 a.m. to 5 p.m., GEO York ReEntry Service Group, 1 East Market Street, York PA 17401. Participants should sign up for an appointment by calling (717) 848-4448. Employers hiring individuals with criminal history will also attend. Participating companies will fill the concourse of PeoplesBank Park and meet with career seekers to discuss full- and part-time opportunities. PeoplesBank Park is located at 5 Brooks Robinson Way in downtown York and accessible by Rabbit Transit Route 2 and Route 6. For more information, visit www.ycea-pa.org.